the controls and approach are a bit simpler. 1.) 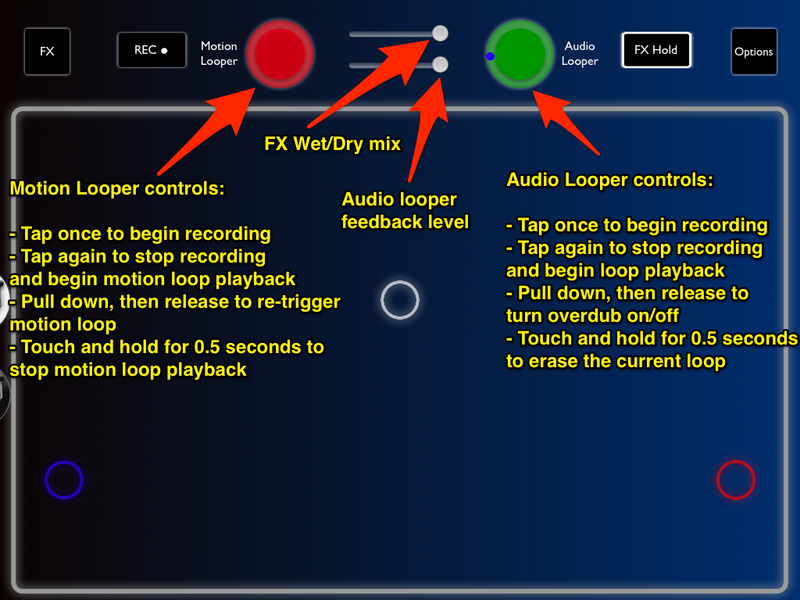 In order to create a loop, tap the Audio Looper button once to begin recording, then tap again to end recording and begin loop playback. 2.) 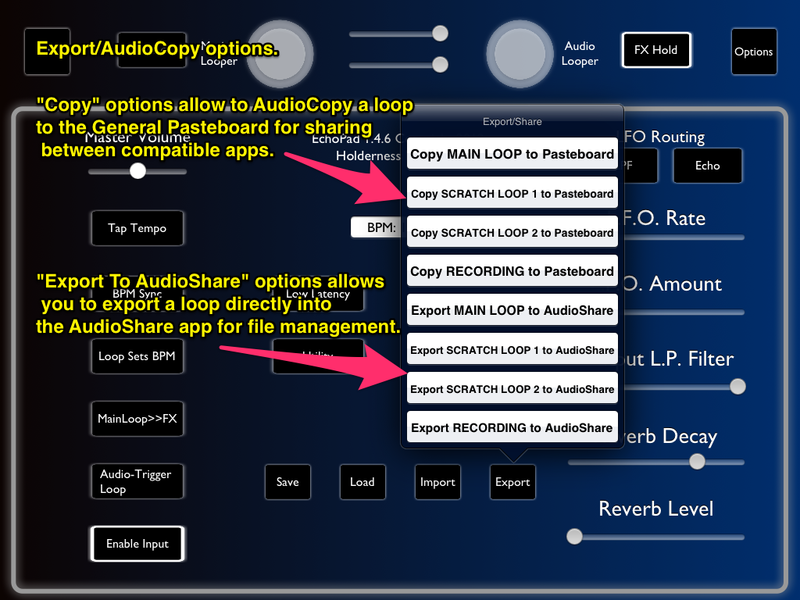 Once you've created the loop, you can enable overdubbing by pulling down on the Audio Looper button, then releasing it. You will notice the loop marker change from blue to red. Pull down and release again to disable overdubbing. 3.) To erase the current loop, touch and hold the Audio Looper button for 0.5 seconds. To export the current playing loop, tap the "Export" button and choose your option using AudioCopy or Export to AudioShare. The audio file is also automatically stored in your documents folder for Echo Pad and can be accessed in the iTunes File Sharing section of your device when connected to iTunes on a Mac/Pc. See the "Importing/Exporting" section for more information on this. In addition to the main looper, Echo Pad has two mini "scratch" loopers. 1.) 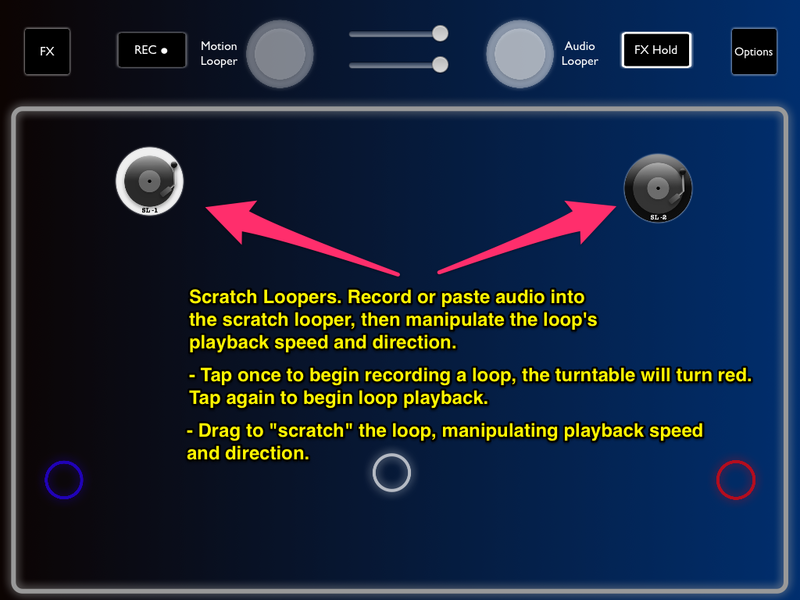 In order to create a loop, tap one of the scratch loopers once to begin recording, then tap it again to end recording and begin loop playback. 2.) Once you've created the loop, you can scratch it like a turntable by dragging up and down to change playback speed and direction. 3.) To stop playback, touch and hold the turntable icon for 0.5 seconds. Audio can now be loaded directly into either of the scratch loopers using AudioPaste. See the "Importing/Exporting" section for more information on this. on using the Motion Looper here. 1.) In order to create a motion loop, tap the Motion Looper button once to begin recording, then control your effects on screen. The Motion Looper button will turn red to indicate recording status. Tap again to end recording and begin motion loop playback. The Motion Looper button will turn green to indicate playback status. 2.) Once you've created the motion loop, you can re-trigger it from the beginning of the loop by pulling down on the Motion Looper button, then releasing it. You can also re-trigger the motion loop from the Audiobus sidepanel by tapping the "ML" button under Echo Pad's controls. 3.) To stop playback of the motion loop, touch and hold the Motion Looper button for 0.5 seconds.